Einstein Printing has been providing a wide range of commercial printing, copying, mailing and signage services for businesses in and around the Addison area since 1980. Founded by Keith and Judy Einstein, the business itself has evolved from a quick-print shop to a full-featured service that offers one-stop shopping for numerous promotional products, binding services as well as quality signs and banners. Einstein printing prides themselves on providing their customers with guidance and assistance throughout the planning stage of their projects. Einstein Printing provides a complete range of cost-effective, versatile and professional solutions to meet any number of printing challenges. Why work with a commercial printing company in Addison? Professional services can save a great deal of time on mass printings and large projects. Tasking existing staff with large-volume projects can lead to reduced efficiency, greater costs and results that may be less than satisfactory. Greater Range of Options, including Farmers Branch Promotional Products, Vehicle Decals and more! Large-volume printing can be quite a challenge for businesses that lack the special equipment, experience and manpower needed to handle such projects. Working with the best commercial printing company in Addison ensures that even high-volume projects may be completed with greater ease and employees will be free to concentrate on other matters. The means to print in a wider variety of sizes, styles and formats often require businesses to invest in special equipment that may have little use for in the long-term. Professional printing means that businesses can enjoy a wider range of formats and options without having to purchase additional equipment and resources. Staying competitive in today's marketplace is not always easy. The means to complete large-volume print orders on short notice can make a key difference. Taking advantage of unforeseen opportunities and the means to complete last-minute projects with greater ease could be crucial. Quick and easy ways to obtain your printed materials can also be of benefit. Dealing with lesser services can lead to inconveniences that many businesses may be unable to afford. Scheduling a pick-up time or arranging to have materials delivered can make a huge difference for businesses that find their time to be in short supply. 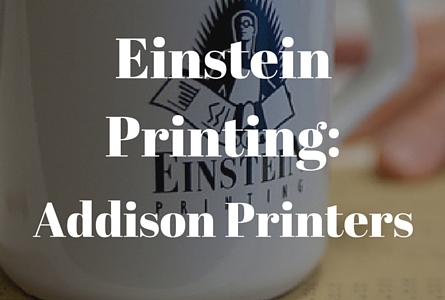 Einstein Printing offers the full range of services that Addison businesses require. Services include manual, business card and document printing as well as large-volume document copying solutions. Other services include corporate identity packages, logo and graphic design, mass-mailings, creation of promotional products as well as binding and finishing services. Einstein Printing is also equipped to create the signs and banners businesses require for trade shows and conventions as well as advertising and marketing campaigns. 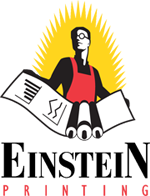 We pride ourselves on providing customers with one-stop shopping for all of their print and graphic design needs. If your business is struggling to handle large-volume print and copy jobs or lacks the resources needed to implement a more effective marketing or promotional strategy, its time to call the professionals. Arranging a consultation to discuss your options and learn more about the full range of services available will provide you with the quality services and convenient solution your business needs to stay competitive and successful.